We take the mystery out of braille and transcribe materials in several languages including English, Spanish, French, Italian, and German. Our braille transcription process meets or exceeds the standards set forth by the Braille Authority of North America (BANA). Grade 1 Braille or Grade 2 Braille? The two most common types of braille are Grade 1 (uncontracted) and Grade 2 (contracted). Here at Braille Works we typically transcribe materials in contracted Grade 2 braille. Grade 1 braille transcription is also available upon request. Grade 1: This is the most basic form of braille and more of an instructional level than a functional level. Every letter is transcribed making the braille document longer. Grade 2: This form of braille uses contractions; or combinations of letters as a single character, and takes up less space on the page. It is the most widely accepted form of braille and is easier for experienced braille readers. Document File Formats: Acceptable formats include MS Word®, Text documents (.rtf or .txt), PDF, Excel, PowerPoint and/or hard copies. Files submitted electronically in MS Word® or Text format are less labor intensive and therefore less expensive to transcribe. Timing: No two jobs are alike. We work with you to develop an acceptable timeline. Paper: We use two types of braille paper. 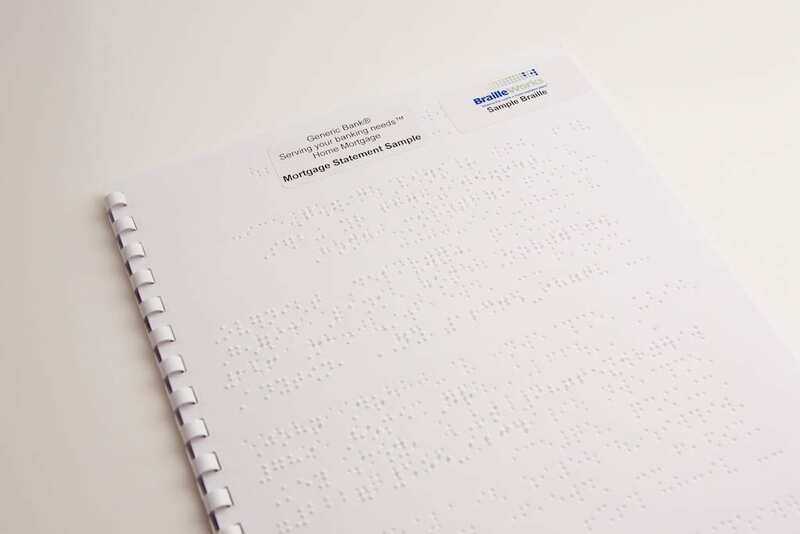 For documents over 32 braille pages, we use 8 ½ x 11 inch paper (92 bright 90 lb. tag) with a high gloss finish. This gives “High Def” dots and makes the braille much easier to read. These documents are bound with a plastic GBC comb or spiral binding and can include protective plastic covers when requested. If your document is less than 32 braille pages, we generally suggest the magazine fold format, which is embossed on super smooth 11 x 17 inch; 65 lb. white cover stock. Several methods of binding are available. 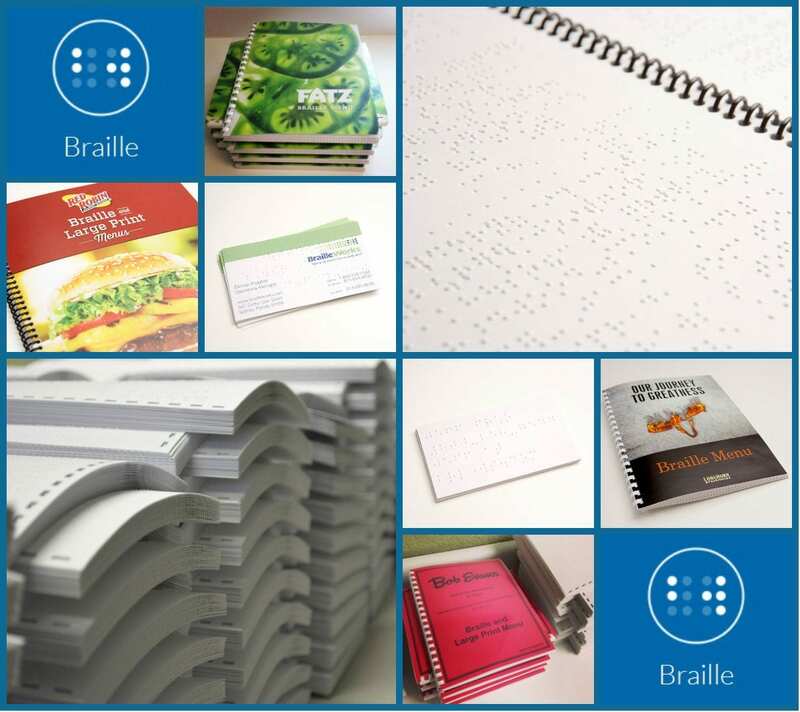 Your Braille Works rep will review the options with you to determine the best method of binding for your projects. 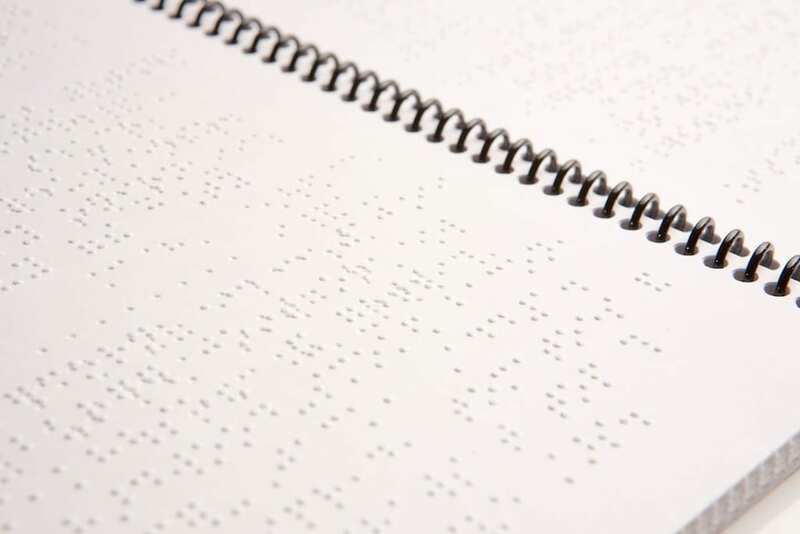 Braille transcription fees vary depending on the complexity of the project and the binding option you choose. Documents that include tables, charts or graphs are considered to be more complex while regular text documents are much simpler. 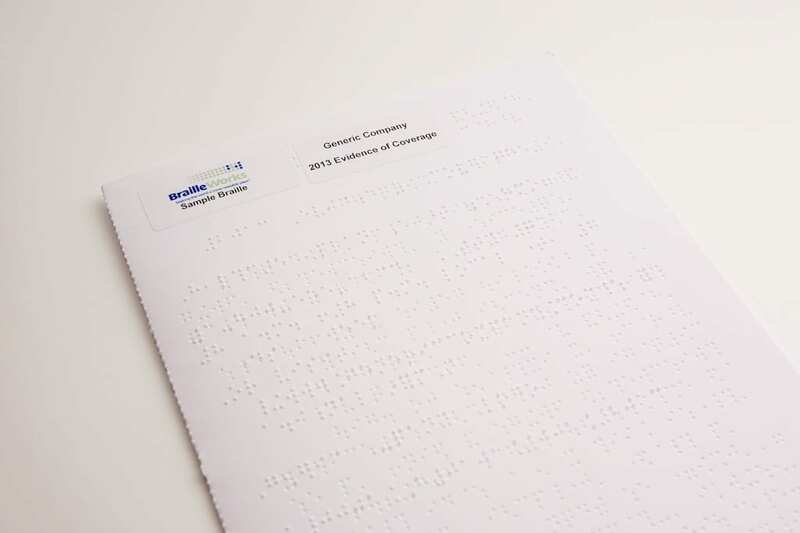 We seek to keep the cost of braille transcription services economical for your business because we appreciate how valuable braille is to its readers.